Over the past few years our company has undertaken detailed research and analysis to identify trends impacting out-of-home location-based leisure and entertainment venues. Some of that analysis has been based on data from the Bureau of Labor Statistics Consumer Expenditure Survey (CEX) and its quarterly interview survey and its diary survey. The CEX documents both spending and participation by households in different consumer products and services. We recently dug into the Bureau of Labor Statistics detailed American Time Use Survey (ATUS) data to see what interesting information and trends it might reveal. ATUS data is based on over 136,000 nationally representative interviews conducted from 2003 to 2012 that examined how, where, and with whom Americans spend their time. The ATUS data is for individuals age 15 and older, unlike the CEX, which is for households. 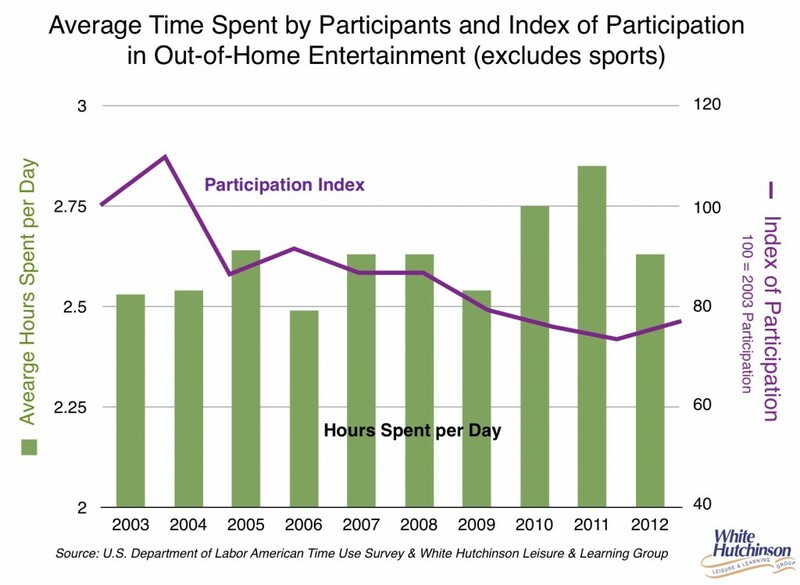 Not surprisingly, when we looked at the data on the time Americans spent at location-based entertainment venues between 2003 and 2012, it showed the same trend we have found in the CEX survey data –participation at community-based arts and entertainment venues, including the movies, performing arts, museums and entertainment venues, is on a long-term the decline. The ATUS data shows that on an average day the percentage of the population age 15 and older attending one or more of the entertainment-cultural venues in 2012 declined by almost one-quarter (23%) compared to 2003. For those attending, their total time spent per average day increased by 4%. As you can see, this is a long-term decline that started back in 2005 with a possible sign of a turnaround to an upward trend in 2012. The downward household participation trend that the CEX data shows started in 2004 and is a less severe decline. The different between the starting dates and the severity of the declines between the two surveys is probably attributable to the CEX looking at the entire household (it only takes one person in the household to count that household as spending/participating), whereas the ATUS data is based on individual person behaviors. This definitely looks like bad news for the away-from-home entertainment-leisure industry. But remember, the trend shows averages at a macro level, not micro data that looks at a particular type of venue and a particular target market. Our company’s research is consistently finding that high quality venues that offer affordable luxury, premium (what is called High Fidelity) experiences for the higher socioeconomic market (and the not so high socioeconomic market that is occasionally looking for aspirational and splurging experiences) are gaining market share and thriving, while the mediocre venues are suffering. This entry was posted in Leisure time, Location based entertainment, Out-of-home, Trends and tagged arts, ATUS, decline, entertainment, leisure, participation, time. Bookmark the permalink. Are you appealing to the Conscientious Consumer? Budweiser does. This page was last modified on March 02, 2019.